HBO has announced that their new Insecure TV show will launch on Sunday, October 9th, at 10:30pm. It will premiere on the same night as Sarah Jessica Parker’s new comedy series, Divorce. Created by and starring Issa Rae, the half-hour comedy series will have 10 episodes in its first season. Created by Issa Rae and Larry Wilmore, the comedy series INSECURE launches its eight-episode season SUNDAY, OCT. 9 (10:30-11:00 p.m. ET/PT), exclusively on HBO. Rae stars as Issa and Yvonne Orji stars as Molly on the show, which explores the black female experience in an unclichéd and authentic way. Meanwhile, Issa’s boyfriend, Lawrence (Jay Ellis), who has fallen victim to complacency, works to get his own act together. Frieda (Lisa Joyce), Issa’s overeager white co-worker, whose enthusiasm is both annoying and endearing, is at the crux of Issa’s racial frustrations at work. Shot in and around South Los Angeles, INSECURE incorporates the music of both indie and established artists of color, and touches on a variety of social and racial issues that relate to the contemporary black experience. Issa Rae wrote the New York Times bestseller “The Misadventures of Awkward Black Girl,” which was published in 2015. Her web content has garnered more than 25 million views and over 200,000 subscribers on YouTube. In addition to making the Forbes 30 Under 30 list twice and winning the 2012 Shorty Award for Best Web Show for her hit series “Awkward Black Girl,” she has worked on web content for Pharrell Williams, Tracey Edmonds and numerous others. What do you think? Do you plan to check out the Insecure TV show on HBO? 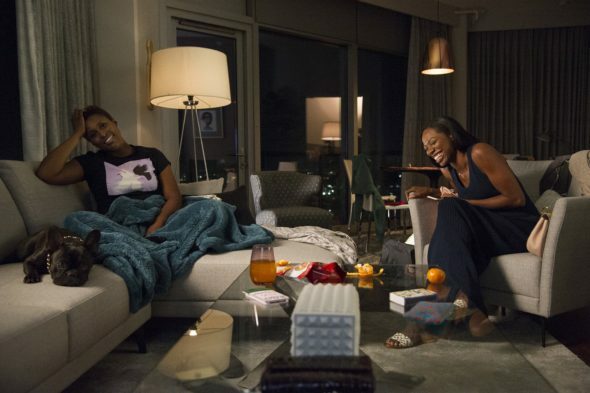 More about: Insecure, Insecure: canceled or renewed?